Throughout the days of January 19th - 22nd, the island of San Pedro was host to a very special lady and her fabulous friends. 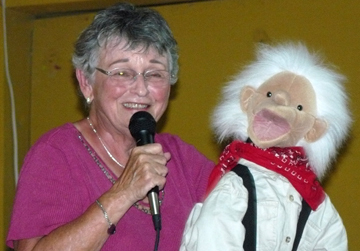 Ventriloquist Charlotte Hansen was in town along with her special helper Tudy and the Bunkhouse Gang. 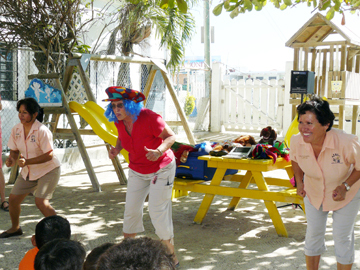 Armed with her fun puppets, Charlotte visited several of the schools on the island, performing special mini-shows and entertaining the children. But the grand finale was a very special show at the Lions' Den. Saturday night saw parents, grandparents and children filling up the seats lined up in the Den in anticipation of a most entertaining variety show. The fundraiser for SAGA Humane Society was completely sold out and at 8:00pm, Charlotte took the stage to give the audience what they had come out to see. Several excited children went onstage to perform the opening dance number for their parents and the night was off to a great start. 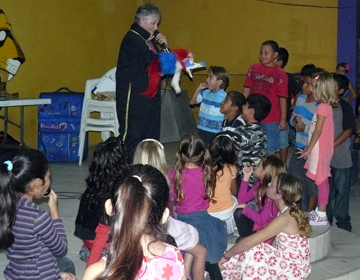 Kids eagerly enjoy the show. 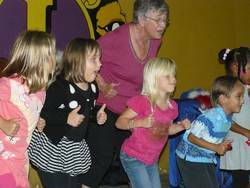 With a medley of duets with various characters, solos, dances and of course, giggles with George Feathers, children and adults were entertained for the better part of an hour. Charlotte blew everyone away with her skills and the applause was loud and enthusiastic. SAGA is equally thrilled to announce that they raised a grand total of $2,593 which means that a lot of dogs and cats will be fed and cared for until new homes can be found for them. In a press release sent out by SAGA on Tuesday, January 25th, 2011, SAGA thanks Charlotte for donating her time and talent to the community of San Pedro, as well as her aide Tudy and the community that showed such wholehearted support for the event. Of course, in San Pedro, everyone rallies round for good causes, so there are a number of other people who helped to make this all possible who deserve heartfelt thanks. These include Jim and Jamila Janmohamed who stepped in to loan their golf cart to help get Charlotte and her equipment around to the schools until Island Adventures Golf Cart Rental were able to generously donate the use of a golf cart, Marty Casado from Ambergriscaye.com, who along with The Tides Resort, made sure that Charlotte had accommodations during her stay, and Colette Kase and Be Kind Belize, who acted as host to Charlotte and was MC for the fundraiser. So many others helped too and deserve recognition and thanks, such as Dianne Lawrence from Quicksilver Messenger Service, Dan & Eileen from DandE's, Velie and Javier of A&J Island Rental, Milo's Ice, Edna Marin (for the famous Chicken Dip),Rebecca McDonald and Sheri Luepke. Of course we can't leave out the SAGA volunteer crew including Elena Rivera, Carolina Gonzalez, Grant Crimmins, Lori Purdy, Rosa La Rosa, Joe La Rosa, Kathy Marin, Ingrid Lima, Mary Hawthorne, Heidi Sowards, Ari Trejo and Bruce (the "Near Sighted Bartender") Pickering! And finally, to the ticket vendors there is more appreciation and these include Oh! Danny Boy Realty, Pampered Paws, Coral Beach Realty, Pelican Properties and Caye Management. Without the local media houses and their support, the event would never have been so successful. As always, SAGA Humane Society could not survive and save so many animals if it weren't for the wonderful San Pedro Community. 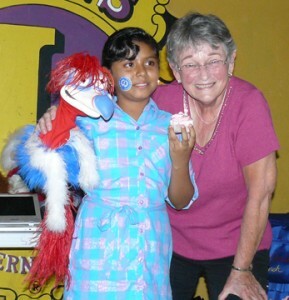 There is one very special thanks left and that is to George Feathers, the wonderful puppet who brought joy and laughter to hundreds of children (and quite a few adults too!)."